On this forlorn speck of land from 1941 to 1942, an embattled force of Filipino and American soldiers fought one of the great delaying actions of World War II. Less than half a century before that, the island had merely watched a U.S. naval squadron destroy a Spanish fleet deployed in Manila bay. Much earlier than that, the island reverberated with the sounds of cannons as Spanish galleons battled Dutch privateers. Situated 26 miles West of Manila, Corregidor lies just off the southern tip of the Bataan Peninsula and guards the entrance to Manila Bay. Dubbed as the "Rock", the island is part of huge limestone formation that juts out of the bay waters. It is about four miles long and half a mile wide at its widest point. 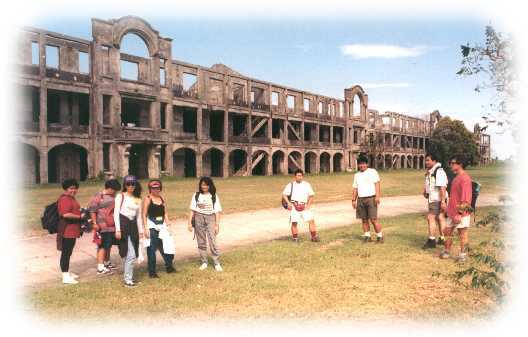 It was fortified by the Americans in 1902 as a military reservation and became a part of the part of the Harbor Defense system of Manila and Subic Bay because of its strategic location. During the Spanish era, this tadpole-shaped island was used as a signal station, where bonfires were built to apprise Manila of a home-coming galleon. Later on, Spaniards built a lighthouse on the island. 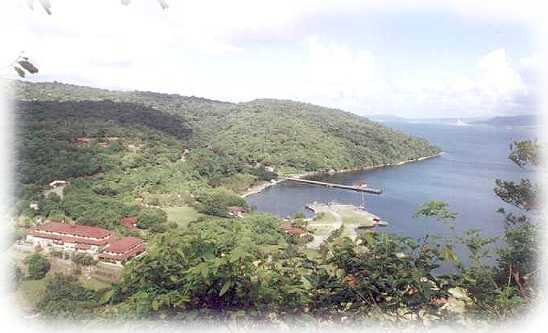 The name Corregidor comes from the spanish word "magistrate" Smaller islands in its periphery have been given such whimsical names as El Fraile (The Friar), La Monja (The Nun), Caballo (Horse) and Carabao (Water Buffalo). Except for La Monja, all these islands were fortified. 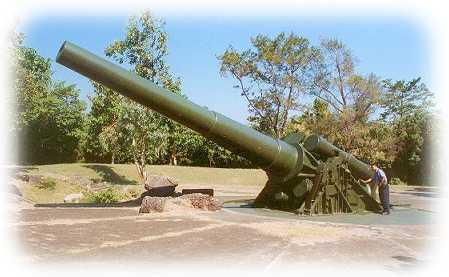 In 1941, the big guns of Corregidor were used to support Filipino and American defenders of Bataan until the island itself was invaded. The incessant pounding by Japanese guns, combined with intermittent bombing runs weakened its defenses and eventually led to its surrender. On January 22, 1945, Corregidor was once again caught in the fury of war as Americans retook the island after an epic. bloody battle. Constructed from 1921 to 1932, Malinta Tunnel has a main tunnel 835 feet long and 24 feet wide. It has 24 laterals which branch out from the main tunnel. 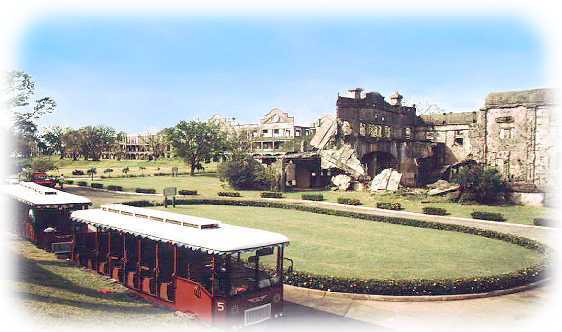 Originally designed as an arsenal and an underground hospital, its unique location beneath Malinta Hill made it an ideal bomb-proof headquarters for embattled Filipino and American troops. During the siege, it served as the seat of the Philippine Government under President Manuel L. Quezon. Today, visitors can experience the the thrills of Malinta Tunnel in a vividly staged Light and Sound show. Scripted by the late Lamberto Avellana, an outstanding film director, the show is a reenactment of World War II's dramatic events. A plan to erect a Hospital Museum within Malinta's historic tunnels is also under way. Completed in 1913, this battery was armed with four 12-inch mortars capable of firing up to 14,610 yards in any direction at the rate of one round per minute (per mortar). Three of the serviceable mortars opened fire on April 28, 1942; and on May 2, two of these were hit. On May 6, after more than 12 hours of continuous firing, the remaining mortar finally froze tight. 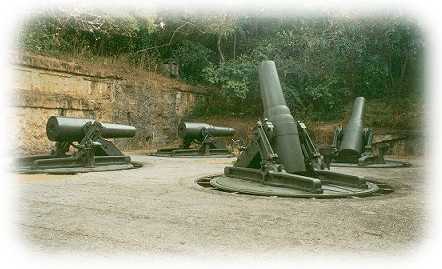 It was the last of Corregidor's "concrete artillery" to to cease firing before the surrender. This 12-inch seacoast gun had a maximum range of 29,500 yards and was capable of firing in any direction. One of the last major additions to Corregidor's defense system, it was captured nearly intact by the Japanese. It had been in action, firing towards Cavite from February 1942, and on April 8 to 9, towards Bataan. So-called because it is the highest point in the island, topside was the nerve center of Fort Mills. (Fort Mills is the nom-de-guerre of Corregidor Island.). Located here was the Harbor Defense Headquarters, Topside (or "Mile-long") Barracks, Senior Officers' Quarters, Parade Grounds, Golf course, Post Hospital and the old Spanish Lighthouse. All the major caliber seacoast artillery emplacements were also situated in this area. Their lofty positions gave the island's defenders an excellent vantage point that covered the narrow North and South entrances into Manila Bay. The highlight the regular Corregidor tour is a visit to the Pacific War Memorial. Built by the U.S. Government, it was completed in 1968. 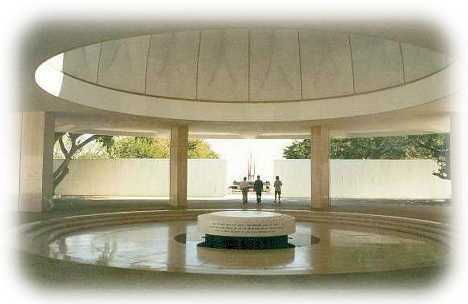 The memorial is dedicated to Filipino and American soldiers who shed their blood on Corregidor. It stands on the highest part of Corregidor on the the west side of the island. Shaded by giant acacia trees, its walkways lead into a dome-capped circular structure, in the center of which lies a beautiful altar-like stone structure. In the distance lies the Eternal Flame monument, an iron sculpture erected to commemorate the valor and fortitude of those who fought in World War II. To the north of the memorial stands the ruins of Cine Corregidor, the old movie theater. President Quezon's and Gen. Douglas MacArthur's official staff cars are permanently dispalyed and parked in a corner of the theatre that used to house the box office. Behind Cine Corregidor is the island museum where war photos, artifacts, and other memorabilia from that bygone era are displaye. There, you'll see swords, machine guns, old uniforms, helmets, old currency, etc. Don't miss it! 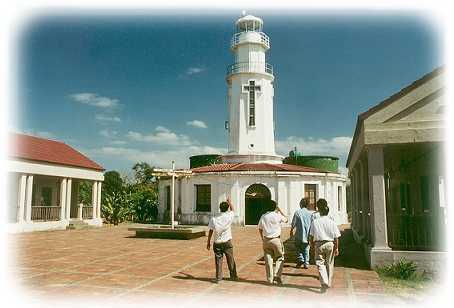 Delight in a breathtaking view of Manila Bay, the South China Sea and the island itself from atop the the lighthouse. With an elevation of 628 feet above sea level, the original structure was built in 1836 by the Spaniards. A larger one was erected in 1897 but was destroyed during World War II. A large, cobbled courtyard in front of the lighthouse adds to the Hispanic ambience, and makes for an excellent promenade or venue for late afternoon or dinner functions. One of the six "disappearing" gun batteries that formed a tightly-interlocking field of fire totally encirling the island, Battery Crockett was armed with two 12-inch seacoast guns mounted on carriages that could hide or "disappear" behind protective concrete parapets. Take note of the mechanism near the rear of the gun, which allowed it to slide up and down. Capable of firing in any direction in any direction with a maximum range of 14,610 yards, the eight 12-inch mortary of this battery were considered the most effective anti-personnel weapons of Corregidor, specially when working in tandem with Battery Way. A new landmark in Corregidor is the Filipino Heroes Memorial, consisting of 14 Murals by sculptor Manuel Casal, depicting both obscure and well-known heroes who battled agains oppression and tyranny through the centuries. The memorial covers events from Lapu-Lapu's Battle of Mactan (1521) to the most recent People Power Revolution at EDSA (1986). All images on this page are from the Corregidor Island Souvenir E-Book, copyright Jose Ma. N. Ramos. Corregidor Island Tour brochure of Sun Cruises, Inc.